Having literally "Blown Away" those in attendance at their Birmingham debut in March, The ELO Encounter made their much anticipated if not rapid return to The Roadhouse last night (Saturday 1st September) - just a stones throw from Shard End (relatively speaking) - and proceeded to once again entertain and enrapture another packed house of Brummies (and the odd Wulfrunian) with an extensive set ELO classics. 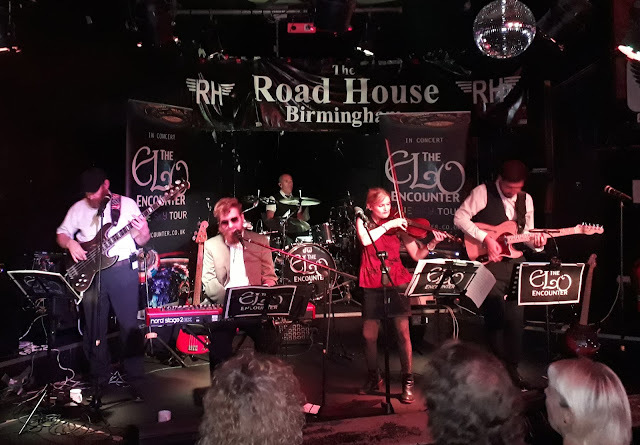 The ELO Encounter have the ability to reproduce the various phases of ELO on stage with apparent ease and this performance proved it. Whether it be the ace vocals of keyboardist Jack Rownes or the essential sound of the band as a unit (with guitarist AJ deputizing nicely for the poorly Martin Donald), The ELO Encounter know how to reproduce the music of the Electric Light Orchestra with accuracy and respect to the production values of Jeff Lynne. The attention to detail by bassist Simon Rownes (including his operatic intro for "Rockaria!") and drummer Simon Dove was of the highest order. A repeat special mention is also due for the wonderful lead vocal provided by Jasmine Ali, which added verve and authenticity to "Xanadu". Whereas most bands tend to leave the likes of "Mr. Blue Sky", "Don't Bring Me Down" and "Roll Over Beethoven" to the end of their sets, The ELO Encounter play 'em early so as to surprise and keep their audience of their toes - even if MBS does make a return as their encore! This means that there is a certain sense of excitement as this Essex based troupe perform. Their set last night was inventive to with five songs from "Time" - including a superb "Ticket To The Moon" - as well as "I'm Alive" (the first time that Yours Truly KJS has heard it live). Elsewhere, it was a pleasure to hear "Nightrider", "Great Balls Of Fire" and "Here Is The News" again amongst familiar faves "10538 Overture", "Ma Ma Ma Belle", "Do Ya" and "All Over The World". 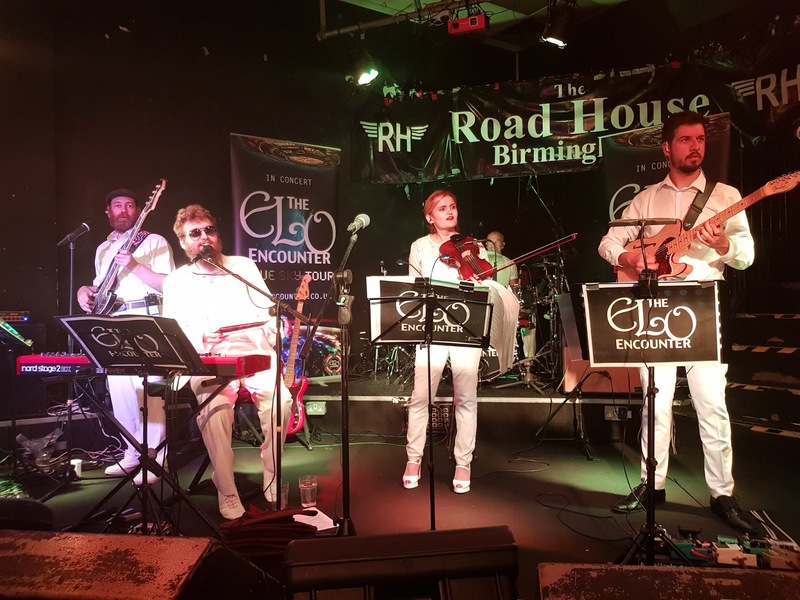 The ELO Encounter are well worth their place with the expanding pool of quality ELO tribute bands. You should consider taking in one of their shows, should they land at a venue near you. The ELO Encounter performed: "10538 Overture" ~ "Evil Woman" ~ "Prologue/Twilight" ~ "Mr. Blue Sky" ~ "Rock 'n' Roll Is King" ~ "I'm Alive" ~ "Ticket To The Moon" ~ "Strange Magic" ~ "Here Is The News" ~ "Turn To Stone" ~ "Telephone Line" ~ "Xanadu" ~ "Showdown" ~ "Confusion" ~ "Don't Bring Me Down" ~ "Hold On Tight" ~ "Roll Over Beethoven" ~ "Sweet Talkin' Woman" ~ "Livin' Thing" ~ "Nightrider" ~ "Ma Ma Ma Belle" ~ "Do Ya" ~ "Can't Get It Out Of My Head" ~ "Rockaria!" ~ "Great Balls Of Fire" ~ "The Diary Of Horace Wimp" ~ "All Over The World" ~ "Last Train To London" ~ "Shine A Little Love" ~ "Wild West Hero" ~ "Mr. Blue Sky"
elobeatlesforever (elobf) recommends The ELO Encounter to those enlightened folks who enjoy the music of ELO, Jeff Lynne, Roy Wood, The Move, The Idle Race, 'Brum Beat', The Beatles and related artistes.